If you have visible veins that are unsightly or cause pain, you may feel that you don’t look or feel like yourself anymore. The experienced physicians at Eterna Vein & Medical Aesthetics in Puyallup, Washington offer vein treatments that improve vein health and reduce the appearance of varicose and spider veins. For more information about vein treatments for the legs, arms, face, or hands, call the office or schedule an appointment online. Varicose veins are enlarged veins that can be visible, unsightly, and cause pain or cramping, especially in the legs. Varicose veins occur when faulty vein valves don’t close tightly enough to regulate the one-way flow of blood from the feet back to the heart, allowing blood to pool and enlarge the vein walls over time. Spider veins are clusters of small blood vessels that are visible just below the surface of the skin. They generally appear red, blue, or purple, and are typically seen on the thighs, lower legs, and face. Spider veins are not usually uncomfortable, so they are generally more of a cosmetic concern rather than a serious health threat. What causes varicose veins or spider veins? Varicose veins frequently arise, or become worse, during pregnancy. 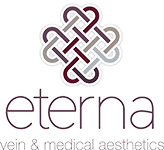 The qualified professionals at Eterna Vein & Medical Aesthetics are skilled at a number of different techniques that alleviate pain and improve the appearance of varicose and spider veins. Veinwave™ uses thermocoagulation to safely heat spider veins and close them instantly. What treatments are available for face and hand veins? Facial veins may be spider veins, or they may be blood vessels that have become inflamed due to rosacea, sun exposure, and other contributors. Veinwave and laser sclerotherapy are options to treat facial veins. Veins that are visible on the hands are not necessarily dysfunctional; hand veins become more obvious as you age, but Asclera is an option for reducing their appearance. Another option is to fill out the skin volume of your hands with injectable dermal fillers. To learn more about vein treatments at Eterna Vein & Medical Aesthetics, call the office or schedule a free consultation online.